The Great Falafel-off! | Mmm, Tasty! 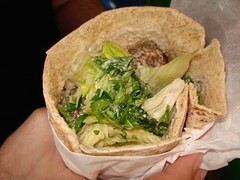 Recently I wrote an article for foodtv.ca about falafel here in Toronto. I thought I’d post something here as well, especially since we’ve been back to both of these places since the article was published. I’m a big fan of falafel. Growing up in the Maritimes, I wasn’t really exposed to it until I moved to Ottawa; the small community I grew up in didn’t have much of a Middle Eastern population. But once I had my first falafel, I had to have more! A good falafel sandwich to me is really simple: lightly spiced falafel balls that are freshly made, good pita, a bit of lettuce and tomato, and tahini sauce. A bit of pickled turnip is a nice addition, but not necessary. Other toppings? No way. This isn’t a Subway sandwich, it’s a falafel! The Annex area of Toronto has a lot of falafel and shawarma shops. I chose to visit two: Ghazale and Laila. The smell from Ghazale is enough to make you salivate, and it tends to waft down the street at all hours of the day. Here their falafel isn’t freshly made to order – it’s reheated in the microwave. However, the rest of their sandwich is pretty solid – good pita, nice sauce, and no weird toppings. They also have some great side dishes to go with your sandwich, should you want a little something. Rich and I tried their lima beans, which are pretty good. Service here is fine, if a bit haphazard – with the store being so small, it can be difficult to tell who is in line for ordering, who has already ordered, and who is just waiting for a friend to finish up. A little assertiveness usually solves that problem nicely. The falafel at Laila is better than that at Ghazale – it’s made to order and has a lovely spiciness to it. It comes piping hot from the fryer with the usual toppings, plus you can request a sprinkle of their hot seasoning mix. There are less sides to choose from at Laila – here it’s mostly about the sandwiches. Another nice bonus is the available seating with tables for about 30 people or so available at the back. And the service? It’s been great on one visit and just ok on another. Nothing to make me not want to go back, but as with most service jobs, things change depending on who is working the counter. Our last visit was a bit disorganized, with people getting their food out-of-turn and some orders being given to the wrong people. It seemed like perhaps they were understaffed, or there was a new person working that evening. We’ll actually continue to go to both places, depending on our mood. However, I’m looking forward to trying some other falafel places in the city!